Continuing with the series, we have Day 5 of Unit 3. This is part 2 of a 3 part series on Collision Detection. I apologize in advance if there are errors in this lesson. I use an online editor and my internet connection was going on and off, so I had to rewrite some of the sections. I may have forgotten to include some details, although I double-checked. If you experience any issues, please let me know! Today, we will be checking for collision in the hands, and handling (correcting) both types of collisions. Before we implement the collision detection, let us first discuss how we will correct a collision. For our purposes, we will be checking two different things. The first test will determine whether the character is on the ground or in the air. The second will check which rectangle has hit something. If we are falling, we do not want our character to grab the platform with his hands. Therefore we will be pretending that the arms do not exist while the character is in the air (it will seem slightly more realistic because the arms will be lifted up). This, however, may cause problems for us if the arms collide after the character hits the ground, so we will have to deal with that appropriately. If we are on the ground (not ducking), we want to check the arms first and then the legs to determine which part of the body is colliding. That way, depending on the height of the platforms, our collisions will adjust accordingly. If we are on the ground and we are ducking, then we want to check just the orange rectangle for collisions. Now that we have planned our approach, let's begin. Keep these things in mind as you write code! Everything will make sense when you understand the strategy. 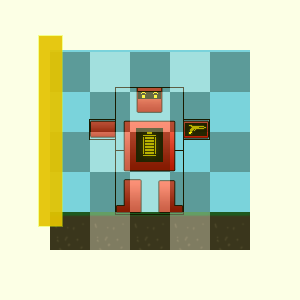 Much like we did with vertical collision, we will be using intersecting rectangles for side collision. We begin in the Robot class. We will use rect3 to refer to the left hand, and rect4 to refer to the right hand. 2. Giving them these following values in the update method (in bold) will place them in the desired location. Recall that the setRect method takes in parameters: (x, y, width, height). Doing this will properly update the two rectangles to represent their respective hands. 3. If you choose, you can paint these rectangles in the paint method of the StartingClass; however, you would do this for debugging purposes, and since I have already tested the code that follows, you do not need to paint them. This always defaults to true. Now all that we have to do is replace if (true) with an if statement that will be true for only these 25 squares. Here's how I would approach writing this statement. Notice that the tileX values for the 25 tiles described here will fall in the red region below. Identically, the tileY values for the 25 tiles fall in the yellow region. Therefore, we can create a rectangle that comprises this red width and yellow height and check if a given tile intersects this rectangle. If it does, than the tile is one of the 25 in the checkerboard region, and we will have to check it for collision. We will now create this rectangle. Despite its name, we will not be coloring it. This will place the yellowRed rectangle at the appropriate location. Open up your Tile class. Now that we have created the yellowRed rectangle, we can create an appropriate if statement for checking collisions. This ensures that all the "empty" tiles, which are simply tiles without images, will have type 0. You will get errors. Please ignore them for now, as we will address them directly after. Recall that the rectangle yellowRed is the "region of 25" tiles that will be checked for collision. The last changes probably introduced several errors to your code. We will be correcting those right now. Let's begin with the footleft, footright errors. 2. Then add the following statements to the update() method. 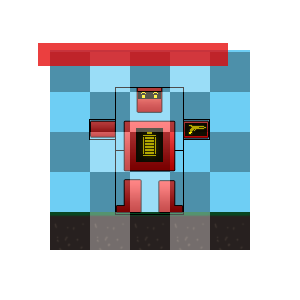 You can safely place them below all the other rectangles (if you need a reference, just scroll down to peek at the finished Robot class). These two rectangles are used for checking side collision when the tile is shorter than the arm height. They are simply small rectangles that stick out a bit farther than the foot. Now moving on to the two methods. You will notice that these completed methods have various checks/tests. You should take the time to go through each of them to make sense of each if statement. 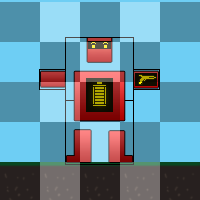 Now that we have completed the collision detection checking code, we must make a few changes. 1. Locate the //Handles Jumping section of the update method. As we handle falling elsewhere, we can remove the first if statement. The if statement that I have created prevents small fluctuations in speedY from registering as jumps. 2. You can now safely remove all the statements that paint our helper rectangles to the screen.